About this object As a close ally of President Thomas Jefferson, Nathaniel Macon of North Carolina relied on the President’s support to win election as Speaker of House in the 7th Congress. 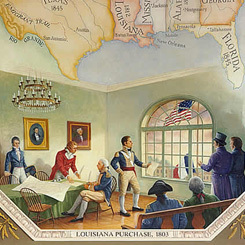 The Louisiana Purchase was the first order of business for the 8th Congress (1803–1805). While President Thomas Jefferson raised a series of constitutional objections to the purchase, Congress brushed them aside and appropriated $15 million towards acquiring the massive land tract. Less successful was the partisan attack on the Federalist judiciary through the constitutional power of impeachment and removal. 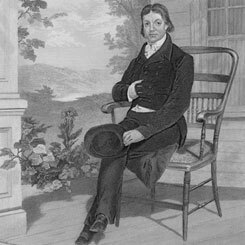 Though Jeffersonian Republicans did successfully remove a minor district judge, the Senate acquitted Supreme Court Justice Samuel Chase, following the House’s impeachment of him. President Thomas Jefferson approved and signed an act to pay France $11 million for the Louisiana Purchase. On this date, the House of Representatives created the Committee on Public Lands, to help Congress manage the newly acquired Louisiana Purchase Territory.